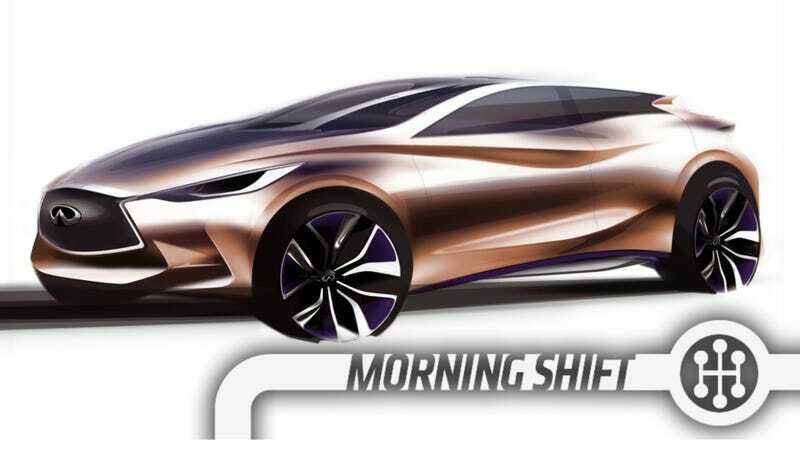 Could The Infiniti Q30 Be The Next Integra? 1st Gear: What Is The Infiniti Q30? Nissan will show the Infiniti Q30 at Frankfurt and introduce us to the closer-to-production design for the brand's important compact luxury car. The question is: What will it be? As young people with jobs are starting to look at luxury cars they aren't immediately jumping into 3-Series and C-Classes like their parents. They want something more affordable, reasonable, and economical. Thus vehicles like the Mercedes CLA (with which, we're told, the Q30 shares a platform). The question is: Which car will the Infiniti Q30 be? Will it be like the pleasant but underwhelming Infiniti G20 that is, in many ways, the car's closest ancestor? Or could it be something else? This will be the first car that Sebastian Vettel apparently put his championship-winning mitts on and, while our recent review of the Infiniti Q50 found them going in the right direction for luxury/tech and wrong direction for fun/performance, I'm still hopeful. Japan once built a great compact luxury car. The best, really. It was the Integra. For no reason other than the involvement of Vettel and a lot of optimism, I'm hoping Infiniti can do what Acura hasn't. Otherwise it'll just be another soft, tech-fueled hatch-y type thing. I'm still working my way through all the data, but Tesla's quarterly profit is actually a $30.5 million loss by the Generally Accepted Accounting Procedures that most car companies follow. The use of non-GAAP measures in a young and growing company should by no means be necessarily seen as a red flag, but it is worth understanding what's going on here. The basic issue is that Tesla's cars are near-universally praised but also very expensive. So to help put people in cars, Tesla rolled out an innovative loan/purchase/buyback scheme that lets people basically lease the cars but with Tesla getting all the money up front via a financing arrangement with Wells Fargo or US Bank. GAAP rules, however, require Tesla to account for this like a lease with money coming in dribs and drabs over the course of the three-year term covered by the buyback guarantee. Measured in those GAAP terms, Tesla lost money. More people have Teslas than did a quarter ago, and Tesla has more money than it did a quarter ago. Whether you want to say that's "really" profitable or not, the bottom line is that Tesla has the financial resources to continue ahead with its strategy and that's what really counts. While the new Civic isn't particularly exciting, it is typically well-engineered as most Hondas are. This is backed up by earning a "Top Safety Pick +" from the Insurance Institute for Highway Safety thanks to a "Good" rating in Crashworthiness. The new Dodge Dart, Ford Focus, Hyundai Elantra, and Scion TC all got "Acceptable." The Sonic, Beetle, and Cruze were "Marginal" performers and the Kia Soul and Forte, as well as the Sentra ranked "poor." There's probably a sweet spot in price where people who aren't fabulously wealthy will buy an electric car and Nissan appears to be getting closer to it. After dropping the price by around $6K to $28,000 (as low as $21,000 with federal/state incentives), demand suddenly and not surprisingly grew. How much? According to Automotive News, a 230% increase in the first seven months of this year, compared to the same period last year. That's around 2,000 Leafs a month and, while it isn't as impressive as what Tesla is doing (selling slightly fewer but way more expensive cars), it's better than nothing and it gives Nissan enough reason to start building more cars if the pattern holds in August. Vauxhall is going to open up its Heritage Center on August 18th with free admission all day. It's located in Luton and they'll have cars going back to 1903 with models such as the 1903 5 HP, the Astra MK1 GTE, and the Lotus Carlton. It'll run from 10:00 am to 4:00 pm and include free parking. On this day in 1963, the 15 thieves involved in the Great Train Robbery, one of the most famous heists of all time, escape in an ex-British Army truck and two stolen Land Rover four-wheel drive all-terrain vehicles, making off with some $7 million in stolen loot. Neutral: What's The Best Compact Luxury Car Of All Time? I still say Integra.